The 8th of May is Floral Day in Helston in Cornwall – usually. If the date falls on a Sunday (as this year) or a Monday, festivities are moved to the previous Saturday. Never mind. When this blog turns 3 years old on the 10th of May I’m going to start celebrating movable holidays. For now I’ll just celebrate Floral Day as if it were today. Longtime readers of this blog will know that I tend to foam at the mouth when people trot out the usual nonsense about the “pagan origins” of calendar customs in Britain, and today is no exception. 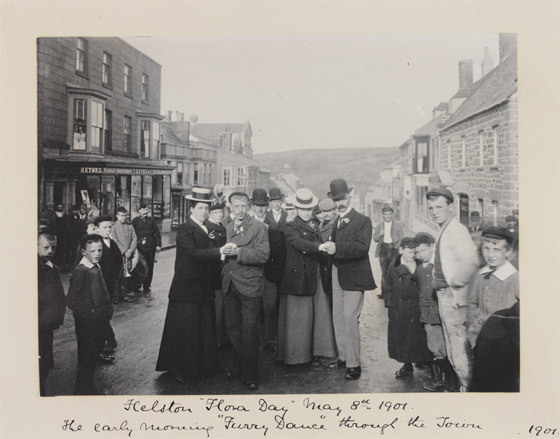 Floral Day in Helston is the time to perform the Furry Dance which everyone will tell you is an ancient custom whose history is lost in the “mists of time.” Nonsense. History does not have mists – it just has idiots. It’s true that Floral Day is a genuinely old custom but there are precious few records of the particulars of its celebration before the 19th century. The practice was “revived” in the 19th century, for fun I presume, and has evolved steadily over the years. Before I talk about present-day customs let me get a few things straight. First and foremost, May celebrations in the south of England celebrate the coming of SUMMER, not SPRING. Sure, May celebrates the turn of the year with flowers and greenery, but May is not really early springtime in Cornwall, but the start of summer — such as it is. 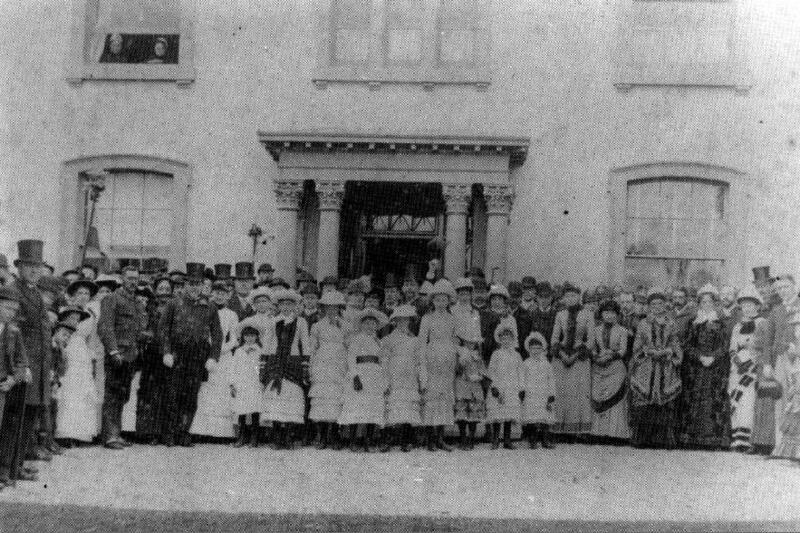 Towards the end of the 19th century and beginning of the 20th century there was a strong movement to revive rural calendar customs in England which were perceived as dying out due to rural depopulation caused by the Industrial Revolution. Many calendar customs were fading, and the decline of rural villages played a part. But these customs were not demonstrably “ancient” and had nothing to do with pre-Christian Britain. They were simply what they seem on the surface – times to have fun. It was misguided 19th century anthropologists and folklorists who imbued the customs with an air of ancient mystery. I’m all in favor of having a good time; I’m not in favor of bad history. Floral Day usually starts out at 7 am with the morning dance. This is a semi-formal procession/dance that kicks off the day. Shops and houses are all decked out with bunting, flags, and greenery, and couples parade through the town, and through a few houses. 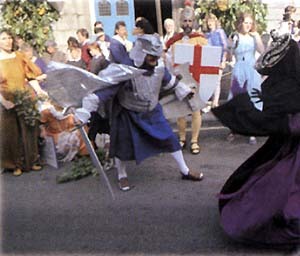 Nowadays it’s become more of a death and resurrection play featuring St George among others – akin to Mummers Plays in other parts of England. The song is certainly old, and its meaning is rather obscure. It does seem to allude to the Spanish – maybe the Armada – but there’s no telling the exact context. Modern versions of the pageant try to make the symbolism clearer by bringing a lot of elements in from all over England (can’t seem to get away from 19th century Romantic syncretism). The pageant is now performed several times along the parade route until 9:30. The pageant is followed by the children’s dance at 10 am. 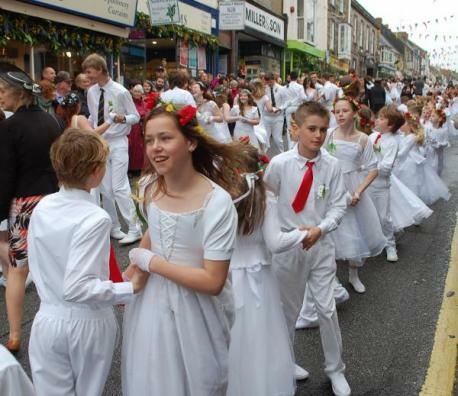 The children’s dance involves over 1,000 children aged from 7 to 18, all dressed in white, the boys with Lily of the Valley buttonholes and the girls wearing flowers in their hair, the flower determined by the school they attend. They come from St Michael’s School, Nansloe School, Parc Eglos School, and Helston Community College: each year a different school leads the dance. The boys wear their school colors in the form of school ties, and the girls wear matching colored flowers (blue cornflowers for St Michael’s, forget-me-nots for Helston Community College, daisies for Nansloe and poppies for Parc Eglos) in their hair. This is followed by the midday dance at noon. There are numerous participants but the number of dancers is restricted. You can apply to participate a year in advance (by mail – no emails !!). Otherwise participation is by invitation. Dress code has been fixed to men in grey top hats and tails, and women in long gowns and big hats. Dress has varied considerably since the late 19th century. 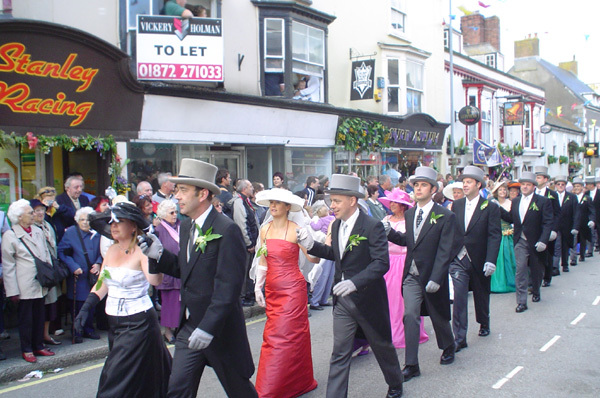 Originally the parade/dance was for the town gentry only, and they dressed in their formal wear, whatever it happened to be. During the First World War some men were in uniform (also on V-E Day which, coincidentally is May 8th http://www.bookofdaystales.com/v-e-day/ ). 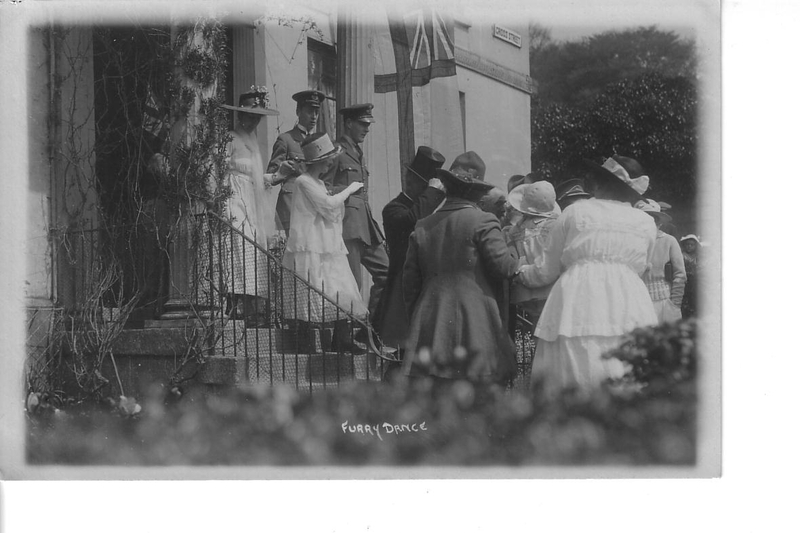 The dance takes various routes through the town depending on circumstances. It parades through certain houses according to custom, but they are not always the same. Some modern owners object to having hundreds of people trouping through their homes. 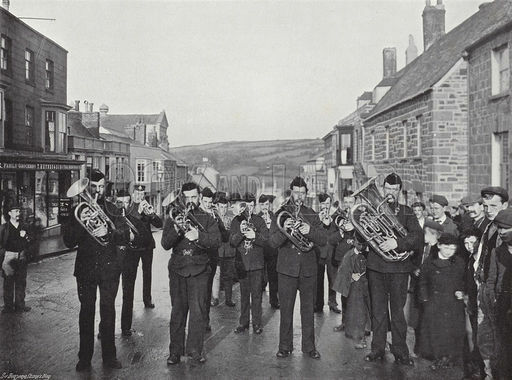 The music for the midday dance is provided by Helston Town Band, augmented by members of other local bands. They play from memory; supposedly the music for the dance has never been written down. I’m sure that it has never been written down officially, but anyone with an ounce of musical knowledge could do so, and I am sure has. The tune is a variant of a dance tune, generically known as “Long Dance” which can be found throughout England. And kissed her three times over. 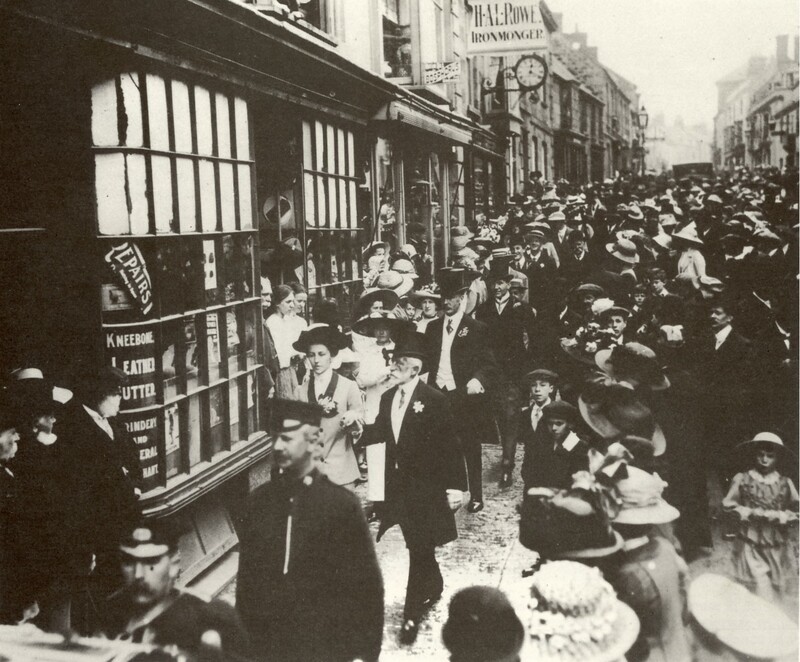 In 1911 Katie Moss, a London composer visiting Helston, observed the Furry Dance and joined in the dancing herself in the evening. On the train home she wrote words and music of a song about her experience, calling the song “The Floral Dance”. She quotes the Furry Dance tune in the piano accompaniment to the chorus – though altering the melody in two bars. This song was published by Chappell & Co., and first performed by baritone Thorpe Bates the same year. The first recording of the song was made by Peter Dawson on the Zonophone label in 1912. It has since been recorded by many other artists.Here’s the original 78 rpm. 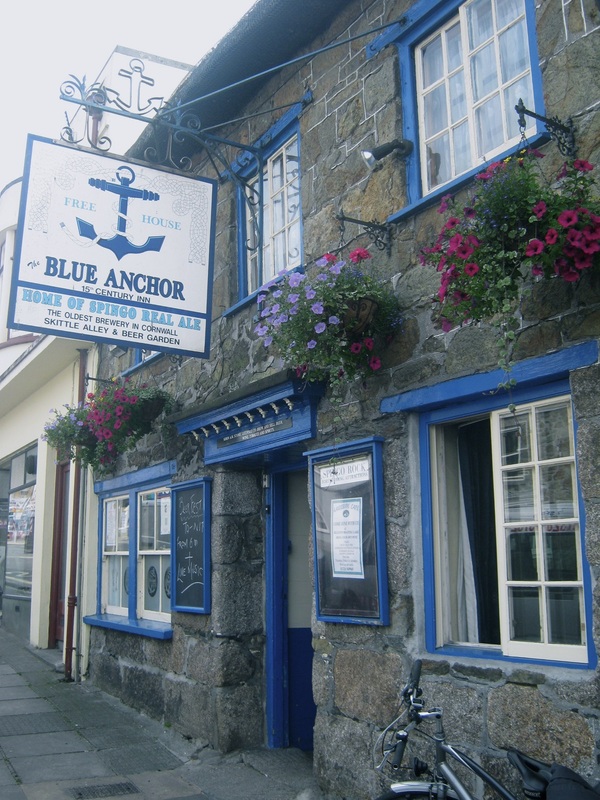 I visited Helston in April 1975 and you can read about my exploits here — http://www.bookofdaystales.com/tin-miners-and-cornish-pasties/ — especially my encounter with Cornish pasties at the Blue Anchor. Pasties would certainly be a suitable dish of the day. Fish pie is also a good option given that Cornwall is generally known for its fish, especially pilchards, and Helston is a fishing port. But for variety I’ll go with Cornish fairings. They are a round, risen gingerbread biscuit that can be found throughout Cornwall. The etymology of “fairing” is obscure (just as the history of Floral Day is). It could be from “fair” – either a celebration, or something nice. Seems suitable. This is from an old Cornish recipe which gives good instructions, but the ingredient list is typically gargantuan for Victorian household recipes. I’d go with one quarter the amount. Mixed spice varies in constituents – usually cloves, cinnamon, allspice, ginger, and nutmeg. You can wing it; I do. When you cut down the recipe you’ll also need to use your own judgment with the spices. I tend to be a bit liberal. Let’s hear it for GREAT British cooking !!! Rub the butter into the flour (you can use a food processor for this step). Put this blend into a large mixing bowl. Put the golden syrup into a basin on its own. Mix the water with the bicarbonate of soda in small saucepan and bring it to the boil. Pour the boiling mixture into the syrup and add the lemon peel. Pour this mixture into the flour and butter. Add the spices and sugar, and mix to a soft dough with a wooden spoon or (preferably) your hands. Roll out the dough on a floured surface to 1″ thickness. Cut into rounds. Place the fairings on baking trays spaced apart. Bake for about 20 minutes, or until risen and golden brown. Fairings can be served warm or cold. They don’t keep long (a day or two).